From the New York Times bestselling author of The Christmas Box —a heartwarming holiday story sure to appeal to Richard Paul Evans’s millions of fans. When Luke graduates from Wharton with his MBA, his father, CEO and co-founder of Fortune 500 Crisp’s Copy Centers, is ready to share some good news: he wants to turn the family business over to his son. But Luke has other plans. Taking control of his trust funds, Luke leaves home to pursue a life of wanton pleasure seeking. But when his funds run out, so do his friends. Humbled and alone, Luke takes a job at one of his father’s copy centers. There he falls in love with a single mother and begins to understand the greatest source of personal joy. 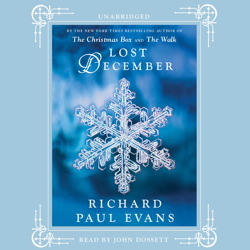 Lost December is Richard Paul Evans’s modern day holiday version of the biblical story of the prodigal son, a tale of redemption, hope, and the true meaning of Christmas.